As we shovel the tons of snow we received in the last week of December, we pause to thank you most sincerely for your generosity to our mission. Your prayers and your financial contributions keep our signal strong throughout this immense, remote region, inspiring, encouraging and informing thousands of village Alaskans. Thank you for your kindness! 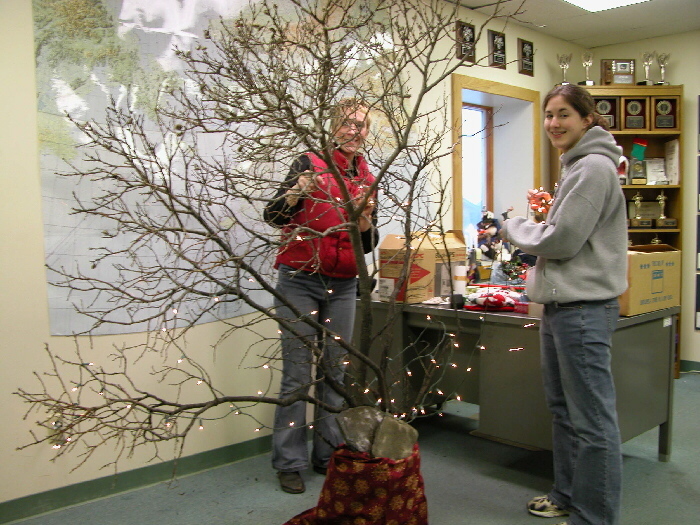 TRIM TIMES: (left): KNOMers Kelly Brabec (behind tree) and Anna Dummer deck the KNOM halls with a branch from a tundra willow for the Christmas holiday. Topped by an angel, the little shrub helped keep things cheery for the KNOM crew, many of whom spent the Christmas holiday thousands of miles from their families and closest friends. IN PRINT: You’ll find a long feature article about KNOM in the January 2004 issue of the popular Catholic magazine St. Anthony Messenger, with lots of pictures. RESULTS: The day after Christmas, a board member of Alaska’s Breast Cancer Detection Center wrote KNOM, thanking us for making a village mammogram program a great success. “Many of the patients reported that they had heard about it on KNOM,” she said. INSPIRATIONAL SPOT: Just how much does God depend on each one of us to reach out and touch the lives of those around us in love? Lots! Who else does He have to do it? 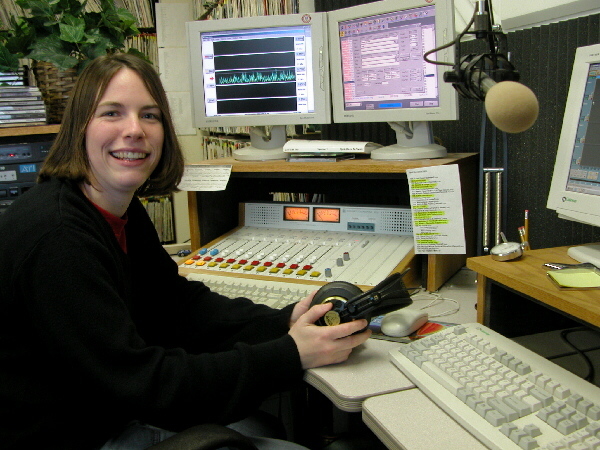 It’s still early in the year, but by the end of January, KNOM will have broadcast about 2,800 inspirational spots in 2004, along with an equal number of educational ones. SOMETHING TO CHEW ON: (left) KNOM volunteer production director Emily Barrett can boast of an international honor, a Crystal Communicator Award, for creative treatment of an educational spot on, of all things, bubble gum. Emily is in her second year as a KNOM volunteer. Two former KNOM’ers also received a Crystal Communicator Award for a humorous original radio play, “The Village of Snome.” Written by Andrew McDonnell and produced by Mike Nurse, the story weaves a fanciful tale of a village on the Bering Sea ice in which everything -- including its inhabitants -- are constructed entirely of snow. Both Andrew and Mike have moved on, to further their educations. Voices for the spot and the story were recorded in Studios B and C, and they were produced at this editing station, located upstairs. RECEIPT: In the third week of January, we will mail receipts to everyone who contributed a total of $250.00 or more during 2003. We’ll be happy to send a receipt to anyone, regardless of amount. Please drop us a line. Thank you! It’s not something we like to think about, but such a gift is likely to be a person’s largest, and it can make a great positive difference for a long time. We place all bequests into funds that provide for major improvements and protect the mission from unforeseen emergencies. INSPIRATIONAL SPOT: We don't have to scheme and labor to have God present in our daily lives. He is already present, waiting to be discovered. INSPIRATIONAL SPOT: Jesus was born in a borrowed manger, he preached from a borrowed boat, he entered Jerusalem on a borrowed donkey, he ate the Last Supper in a borrowed upper room and he was buried in a borrowed tomb. Does that tell us something about our habit of collecting things? GET THE DRIFT? 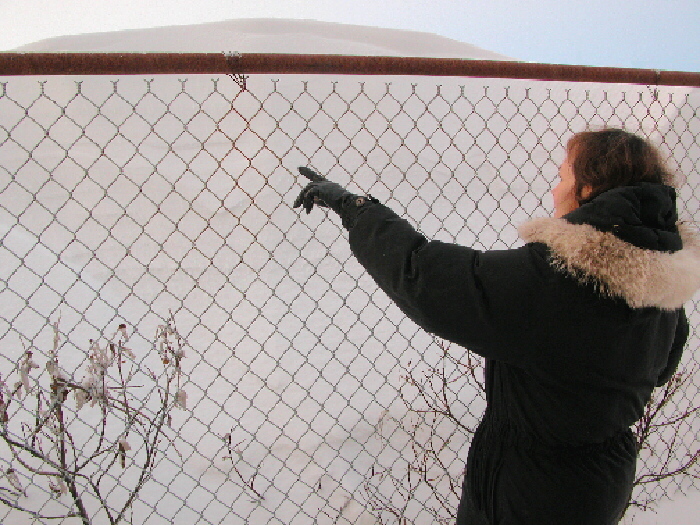 (left) Business manager Florence Busch examines a seven-foot snowdrift next to her yard. In December, a series of powerful storms left Nome buried under such drifts, some as high as second-story windows. Often in Nome, the wind is so violent that it sculpts long, high drifts in some places, while scraping the ground bare in others. Nome went without Federal Express service for a full week, and the last five days of 2003 saw only one mail plane. APPLY TOPICALLY: Every weekday, KNOM broadcasts a “Profile” program, ten-to fifteen-minutes of interviews dealing with topics that are important to the region. Recent subjects included Siberian Yupik traditional stories, new fish and game rules, rural Alaska foster care, suicide prevention, geothermal power, developing a healthy lifestyle, influenza, after school village youth programs, bush Alaska health care, regional transportation plans, Bering Strait archaeology and emergency medical services, among others. JUNEAU JOURNAL: That’s the title of a new program on KNOM, hosted by volunteer deputy news director Julia Dunlap. Nome is 1,097 miles from Alaska’s capital. That’s the same distance as New York City to Omaha! You can see why many villagers feel especially remote from where many decisions that affect their lives are made. KNOM’s newscasts will continue to cover legislative issues, and we will continue 2003’s practice of interviewing a prominent legislator every week. Julia’s program is designed to provide a concise twice-weekly summary that will put events in perspective. Thank you for making this, and all of KNOM’s educational and informational programming possible! INSPIRATIONAL SPOT: There are only fourteen hundred-forty minutes in each day. And they go by so fast! Let’s do our very best to make the most of every one of them. INSPIRATIONAL SPOT: Every great achievement in history was once considered impossible. So many things have yet to be accomplished in our own lives, our own great achievements, which can seem impossible to us. With God’s help and our hard work, they become possible. DEER, DEER! 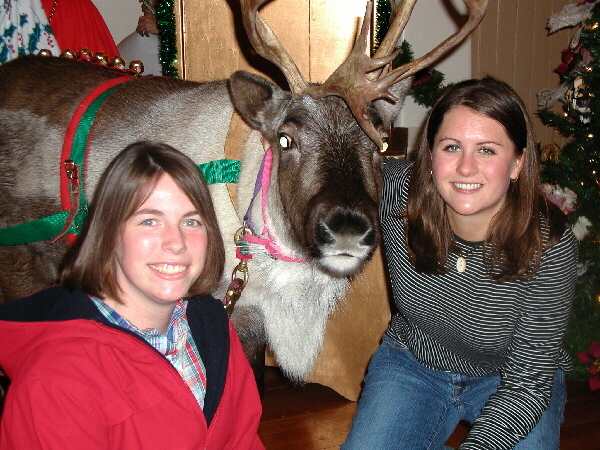 (left) KNOM volunteers Emily Barrett, at left, and Amy Flaherty make friends with Santa’s reindeer during the City of Nome’s holiday party. THIRTY YEARS AGO: From the isolated town of Kotzebue 184 miles northeast of Nome, Father Mike Kaniecki, SJ, flew in with two parish volunteers for a visit with the KNOM crew. The January 1974 “Nome Static” reported that winter was raking the area with “first class” storms. PROMISES: As the new year begins, we renew several promises to you. We strictly adhere to the National Catholic Development Conference’s principles of accountability and stewardship. We pledge to represent our mission honestly in all fundraising, and to provide financial information to any contributor who wishes it. We strictly adhere to the Diocese of Fairbanks’ sexual misconduct policies. We realize that in some areas of the Catholic Church, misconduct has occurred in the past, and we pledge that it will not occur here. We repeat our longstanding promise that we will never provide your name and address to anyone, for any reason. Once more, we thank you for your contributions and your prayers. Our mission would quickly disappear without both. We have many challenges ahead. At present, we are trying to develop firm cost estimates for our expansion of translator transmitters that will bring a strong KNOM signal into thirteen villages. Please stay tuned! You remain in our thoughts and our prayers. Thank you for your great kindness to the isolated people whom we serve. May God greatly bless you for it.